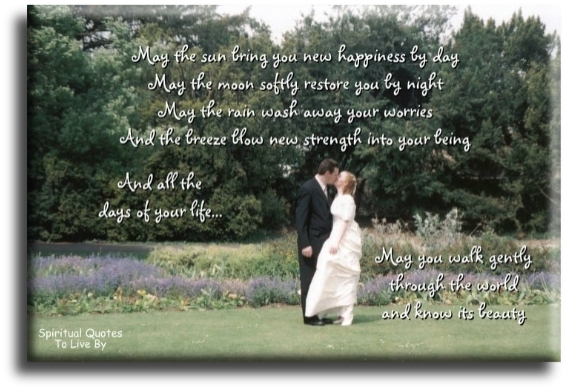 Some of these wedding day quotes and poems would make wonderful readings for a ceremony. Used as they are, or adapted to suit, they can make your day extra special and memorable. Having a reading during your ceremony is also a great way to involve a family member or friend, asking them to do a reading for you makes them an important part of your day. Your chosen words are significant, as they express your personal views on love and marriage to all of the closest people in your lives, who are there to witness and celebrate your special day with you. Your choice of words are also a way of making your ceremony unique and memorable for your guests. 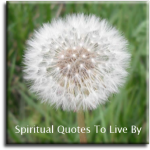 There are also shorter quotes about the wedding day on this page, along with more inspirational words and poems from unknown sources on the Wedding Sayings page. You are my friend. And a friend is one to whom one may pour out all the contents of one's heart, chaff and grain together, knowing that the gentlest of hands will take and sift it, keep what is worth keeping and with the breath of kindness, blow the rest away. There is nothing without a cause. The coming together of this man and woman is not an accident; it is the foreordained result of numerous previous lives. This bond cannot be made less or broken. In the time ahead, this joyous occasion will arrive as surely as the morning even though difficult times will arrive as inevitably as the darkening night sky. When things go joyously, take the time to meditate. When things cause you sadness, take the time to meditate. To only say the words 'love and compassion' comes easily, but to know that love and compassion are dependent on perseverance and patience is not easy. If you remember this, your marriage will have strength and be everlasting. What greater thing is there for two human Souls than to feel that they are joined for life. To strengthen each other in all labour, to rest on each other in all sorrow, to minister to each other in all pain, to be one with each other in silent, unspeakable memories at the moment of the last parting. May you always need one another - not so much to fill your emptiness as to help you to know your fullness. A mountain needs a valley to be complete; the valley does not make the mountain less, but more; and the valley is more a valley because it has a mountain towering over it. So let it be with you and you. May you succeed in all important ways with one another, and not fail in little graces. May you enter into the mystery which is the awareness of one another’s presence - no more physical than spiritual, warm and near when you are side by side, and warm and near when you are in separate rooms or even distant cities. Give your hearts, but not into each other's keeping. For only the hand of life can contain your hearts. And stand together yet not too near together. For pillars of the temple stand apart, and the oak tree and the cypress grow not in each other's shadow. I chose my wife, as she did her wedding gown…not for a fine glossy surface, but such qualities as would wear well. And as this round (ring) is nowhere found to flaw, or else to sever. So let our love as endless prove and pure as gold forever. Come live with me and be my love and we will all the pleasures prove. Marriage is the weaving together of families, of two Souls with their individual fates and destinies, of time and eternity - everyday life married to the timeless mysteries of the Soul. Now you will feel no rain for each of you will be shelter to the other. Now you will feel no cold for each of you will be warmth to the other. Now there is no more loneliness for each of you will be companion to the other. Now you are two persons but there is only one life before you. May beauty surround you both in your journey ahead and through the years. May happiness be your companion to the place where the river meets the sun. And may your days be good and long upon the Earth. May the sun bring you new energy by day. May the moon softly restore you by night. May the rain wash away your worries. May the breeze blow new strength into your beings. And all the days of your lives may you walk gently through the world and know its beauty. Treat yourselves and each other with respect. And remind yourselves often of what brought you together. Give the highest priority to the tenderness, gentleness and kindness that your connection deserves. When frustration, difficulty and fear assail your relationship, as they threaten all relationships at one time or another, remember to focus on what is right between you, not only on the part that seems wrong. In this way you can ride out the storms when clouds hide the face of the sun in your lives, remembering that even if you lose sight of it for a moment the sun is still there. And if each of you takes responsibility for the quality of your life together, it will be marked with abundance and delight. When evening falls there you will both be. You'll take each other's hands and turn together to look at the road you have travelled to reach this, the hour of your happiness. It stretches behind you even as the future lies ahead. A long and winding road whose every turn means discovery. Marriage resembles a pair of shears, so joined that they cannot be separated, often moving in opposite directions, yet always punishing anyone who comes between them. Your love is from life's great mystery. It lies beneath a great quiet lake. It is like the deep truth of a dark well. Your love is purity and coolness. You have no need to make waves in the water. You have no need to dig another well. You only have need to watch yourself with clarity and drink deeply from your love. They’re about to say I Do. Three little letters. Two little words. It’s the simplest part of the day, but there is nothing simple about the things that will remain unsaid. I Do means - I Do know I could be hurt, but I’m ready to be healed with you. It means I Do want to try, even when the fear of failure holds me back and I Do not know the future, but I’m ready to be surprised along the way. And I Do means I Do want your love and I Do give you mine and nothing we do will ever be the same because you and I will be doing it all together. My mother's family were evacuated to Oxford during the war. 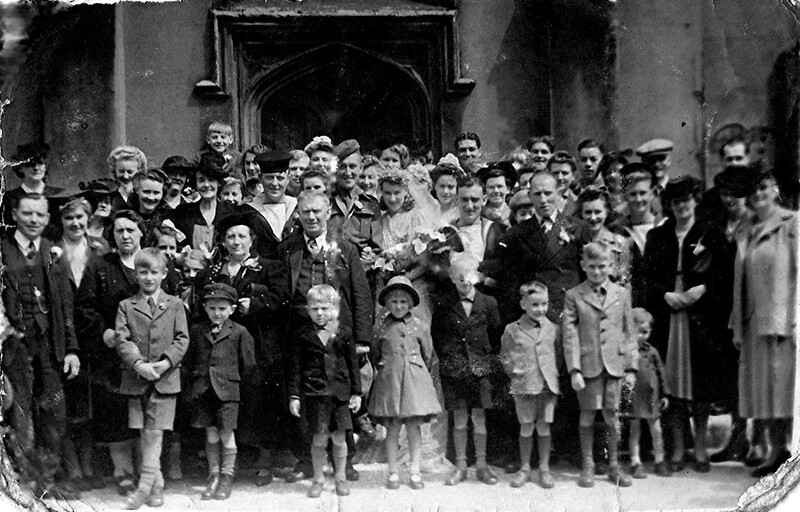 In 1944 her father took her back to London for a family wedding. Apart from having a new outfit for the occasion her main memory of that day was the sights and smells of a bombed London. 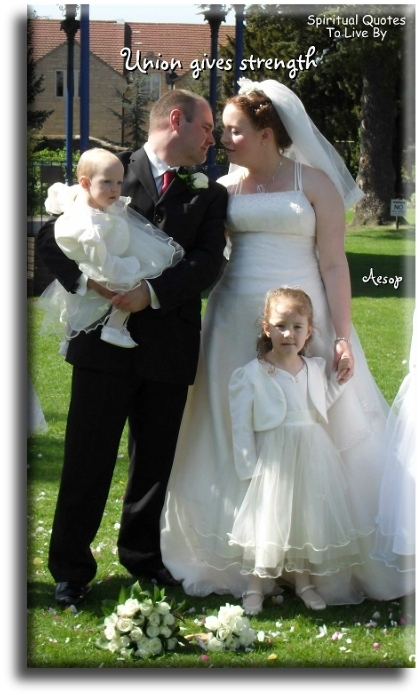 She is the little girl in front of the bride and her father is on the far left.